Save AED 33 (53.23%) – Earn 3 Shukrans What is Shukran? Shukran is the Landmark Group’s award-winning loyalty programme in the Middle East, which allows you to earn Shukrans when you shop any of our brands. A smart pick for your boy's occasional wardrobe, this textured t-shirt is one dapper buy for him. 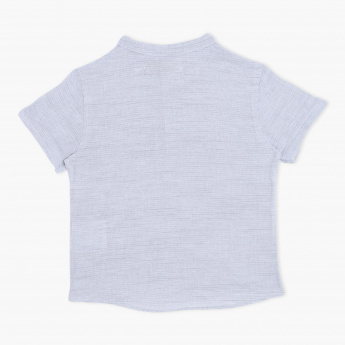 Sporting short sleeves and a half placket, this comfy piece is ideal to wear with jeans and sandals.